These "sipes" are an innovative technology that allows the tread elements of the tire to interlock which stabilizes the tread. This maximizes tread contact with the road surface to grip the road better, significantly increasing traction in wet conditions and light snow, and resulting in superior handling. Micro-gauge sipes also reduce potential stones captured in the tread. 185% MORE SIPING AT HALF-WORN THAN HALF WORN CTSThe SRX has 33% more sipe length than the Discoverer CTS when new. This results in significantly more biting edges and shorter stopping distances when road conditions are wet or wintery. At half-worn the SRX sipes have 185% more of their length remaining than the CTS. This feature aids in performance and significantly improved worn appearance. The optimized pattern evenly distributes the load across the tire’s contact patch leading to improved treadwear, responsiveness and handling. The traction grooves maximize the expulsion of water away from the tread surface effectively reducing the potential of hydroplane and increasing the grip capability of the tire. The winter-edge feature creates a higher snow grip area in the tread by locking onto snow and enhancing the snow-on-snow grip that ultimately provides better traction in adverse winter driving conditions. Recessed geometry does not interupt flow of water for good hydroplane resistance. "StabiledgeTM" is the bumper strategically located in several grooves of the tire's tread which help stabilize the tread elements during driving conditions enhancing the steering precision while providing a better feel for the road. The stabiledgeTM feature also assists in keeping the grooves open at the "tire-to-road" contact area providing good traction. The placement of these tread ribs in the shoulder and intermediate tread blocks reduces noise and increases wet traction and handling performance. The use of alternating groove angles increase snow traction, wet grip and minimizes potential noise. By strategically integrating element corner chamfers the tire resists irregular wear, reduces the potential for noise and improves the overall ride quality. The secret to any tire’s traction begins at the molecular level. Silica provides exceptional all-season performance, improves braking, reduces heat generated in the tire and lowers rolling resistance for better fuel mileage. Cooper’s unique blend of silica has up to four times more silica than the previous generation of premium all-season tires which dramatically increases this tire’s performance. 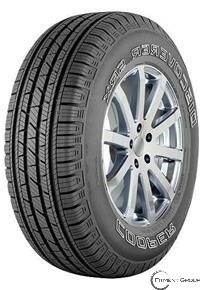 This formula also reduces rolling resistance by 15% compared to the Cooper Discoverer CTS. This is a visual wear indicator so that as your tire wears the shape of the visual wear indicator will change allowing you to approximate the tread life remaining on your tires. Knowing the approximate tread life remaining on your tires can give you more confidence in your vehicle. If the inner and outer “Wear SquareTM” is at different stages, this indicates a possible wheel alignment issue allowing you to seek professional service.